Books 1 and 2, Path to Vengeance and Sorcerer’s Duel, have been formatted and uploaded to Createspace. I am awating proof copies, and once they are satisfactory, the two books should be available as paperbacks shortly afterwards. Book 3, A Guardian Reborn, is currently being revised. Estimated publishing date is now looking to be Late October, possibly November 2012. The extensive editing undertaken on books 1 and 2 has resulted in more work being required on subsequent volumes in the series to ensure continuity and to maintain the quality of my work. 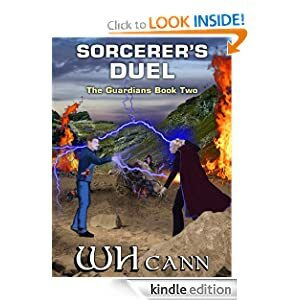 Sorcerer’s Duel, book 2 in the Science Fiction Fantasy series The Guardians, receives a 5 star review by Thatfantasyblog. Some of you may know that this is the second book in the Guardian series by W H Cann and if you don’t know that you can read my review of the first book here. Now i would just like to say that i loved the first novel but a few minor problems held it back from being a 5 star read. I am glad to say that Cann contacted me about said issues and took the ideas on board and has released a newer, much more streamlined version, that is a simple joy to read. His second novel in the Guardian series has benefited from a more vicious edit and is a fast paced gem. But i get a little ahead of myself. Here’s the review. “Having survived the Battle of Mabraant and with no system in the quadrant safe to settle on, Grogaan leads his friends on a new adventure deep into the heart of the neighbouring Ladorran Quadrant. After being reunited with his soul-mate, Grogaan and Ellarna meet the famous Guardian Master Sorann Taggash. The Master confirms Grogaan’s adeptness in magic, and although Grogaan already knew Ellarna was also adept in magic, she was surprised when Sorann reveals the fact to her. Grogaan and Ellarna under the supervision of Sorann, embark on a training programme to become Guardians. Grogaan’s skills develop swiftly but his emotional control due to past trauma and depression hinder his development. They take a short break to undertake a dangerous mission back to Mabraant, where Grogaan and Kopaz Squadron tempt fate to the limits, and deal another painful strike to the Empire. For me the previous novel always lacked that emotional punch which can really make a novel a standout classic. Thankfully this novel has a big suckerpunch of emotion concealed within its pages (or should i say the casing of my kindle?). From the get go i found Grogann to be a much more engaging and loveable character than i ever did in Path to Vengeance. In the first novel i don’t think i would have cared if he’d have died but in Sorcerers Duel i wanted him to live and succeed and live to fight another day. But its not just the characters which are better in the second outing, everything is damn well better. The writing is quicker and more fluid, the dialogue more realistic and flowing rather than stilted and forced affair that i struggled through in the first novel. Suffice to say this novel is better in every aspect. The characters are more developed, better refined and more likeable. For me personally the story line was more fun, more action packed and with a much quicker sense of pace than the original. Cann himself seems more comfortable with the futuristic fantasy world he has created, from reading the novel i get the sense that the writing has come easier the second time around, that the characters are slightly clearer and the universe slightly more colourful in his mind. From reading this novel and comparing it with the first one it is as though i am looking literary evolution in the face. I have witnessed not only the evolution of a fantasy world but also the evolution of the author behind it. Cann has come on leaps and bounds since the first novel and has created an almost flawless gem for all his trouble. I don’t want to give anything away from this novel as i think you need to read and experience the gems of the Guardian series for yourself. You can get a copy of Sorcerers Duel here and the revised edition of Path to Vengeance here. Thank you W H Cann for such a fantastic novel. I look forward to your future work. The Smashwords Summer/Winter sale starts 1st July 2012 and runs to the 31st July 2012. I will be including my two published books in this sale; Path to Vengeance and Sorcerer’s Duel, priced at $0.00 and $1.49 respectively. Following feedback from various sources, Path to Vengeance has recently undergone a thorough revision and edit, and as a result is a great improvement on the original release. This has been released as Edition 2. I have also released a revised version of Sorcerer’s Duel after making a few minor edits I felt were required. The third book in the series ‘A Guardian Reborn’ is taking longer to revise than I anticipated, but I still hope to release this late September/Early October 2012. Both books are available from Amazon (all sites) Smashwords, Sony, B&N, Kobo, Apple, Diesel, Baker & Taylor & Page Foundry.